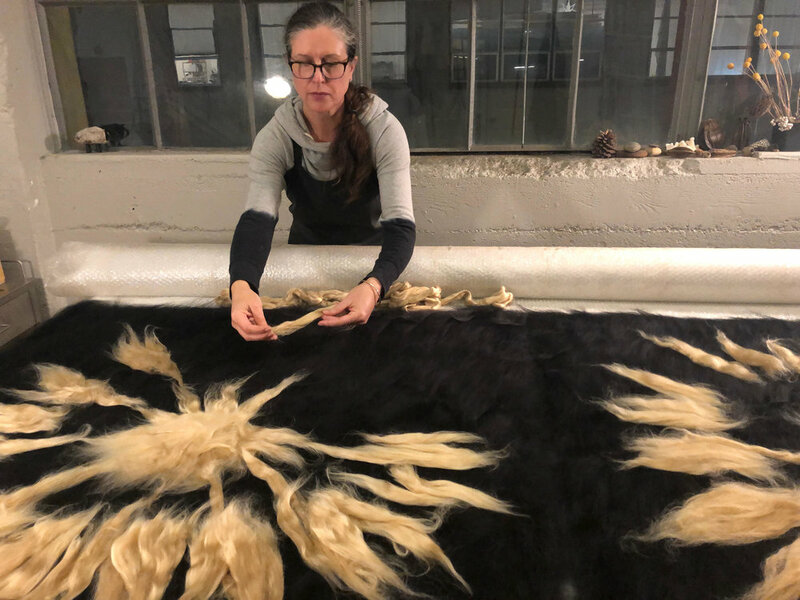 The hand felting process is slow and arduous, requiring an intensive repetition of condensing, pressing and agitating fibers to create a dense, matted texture. Because the matter is organic, the process is too, yielding sometimes unexpected results, which only lend to the beauty of these one-of-a-kind products. The result is an exceedingly soft and tactile surface that stands out from any other. Fog & Fury’s felt is made from wool and may include other speciality and exotic fibers such as alpaca, llama, camel, yak and rabbit. The colors in the felt designs are all natural, undyed and reflect the colors of the various breeds of animal fiber. Some designs also include all natural undyed eri, tussah, mulberry and muga silks. Only the finest fibers are chosen and sourced from our local fibershed and US locales whenever possible, and from as far afield as northern Europe or Australasia when quality and color demands it.